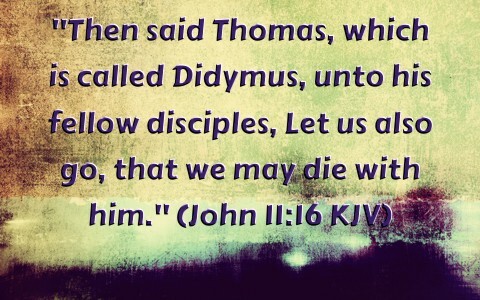 The Apostle Thomas might have been one of two twins in his family because his name “Thomas Didymus” means “the twin” but he is usually better known as or referred to more often, unfortunately, as “Doubting Thomas” which we will later read why he was referred to by this nick name. We don’t hear much from Thomas in the gospels at all and he is rarely mentioned until just prior to Jesus going to the cross and after His death at Calvary. One thing that I admire about Thomas is that he asked questions when others might have just been wondering about things but were hesitant to ask. For example when Jesus said that He was going away and that He was going to prepare a place for the disciples and would come again for them (John 14:2-4) everyone else was silent. When it seemed no one else would speak up, Thomas asked “Lord, we do not know where you are going. How can we know the way” (John 14:5)? The other disciples might have been thinking the same thing but Thomas wasn’t’ shy about asking. At least he asked where Jesus was going to which Jesus responded by saying that He is “the way, the truth and the life” (John 14:6). I think we are too hard on Thomas because Thomas was ready to go up to Jerusalem and die with Christ (John 11:16) while the others tried to talk Jesus out of going back to Judea (John 11:8). When Lazarus had died Jesus said “Let us go to Judea again” (John 11:7b) but “The disciples said to him, ‘Rabbi, the Jews were just now seeking to stone you, and are you going there again?’” Jesus answered, “Are there not twelve hours in the day? If anyone walks in the day, he does not stumble, because he sees the light of this world” (John 11:8-9). So the disciples apparently tried talking Jesus out of going for fear of being stoned and the disciples probably didn’t especially want to go either because if Jesus was stoned, what would become of them? Did they have fear about going back to Bethany too? Thomas seemed the bravest of them all by saying “Let us also go, that we may die with him” (John 11:16) so we should give Thomas some credit as he was apparently ready to die for the Lord, unlike the other disciples at that time. I think it’s unfortunate that Thomas has the label “Doubting Thomas” because he was never called that in the Bible. That is a label that we have put on him and I do think it’s a bit unfair to him. How many of us who had been eyewitnesses of Christ and thought that He was the Messiah but was then later killed by unjust methods, illegal trials and evidence, by despicably wicked men would have doubted just as Thomas had? Wouldn’t we too have given up when all of our hopes were apparently dashed to pieces when Jesus was humiliatingly crucified? I believe I would have. Thomas must have been heartbroken, having all his hopes crushed when Jesus died on the cross. We should realize that the disciples were not any less doubting than Thomas was because after Jesus’ death, they were in hiding and had the doors locked for fear of the Jews, perhaps thinking that they would be next (John 20:19). It was only after Jesus appeared to them that they finally believed. That’s when they tried to tell Thomas which is recorded in John 20:24-25, 28 which says, “Now Thomas, one of the Twelve, called the Twin, was not with them when Jesus came. So the other disciples told him, ‘We have seen the Lord.’ But he said to them, ‘Unless I see in his hands the mark of the nails, and place my finger into the mark of the nails, and place my hand into his side, I will never believe’ [but when Thomas saw Jesus] “Thomas answered him, ‘My Lord and my God!’” Thomas made the first public profession of Jesus as being both Lord and God so let’s try not to judge Thomas too harshly because I believe if we were in his place, we too would have doubted. Church tradition and history tells us that Thomas traveled outside of the Roman Empire as a missionary, possibly as far away as India to preach the gospel, which is yet another indication of Thomas’ boldness. He may have reached Muziris, India where he baptized several believers and was possibly the first to bring the gospel to the Far East. This might explain why he is considered the Patron Saint of India. His name in the Indian language, “Thoma,” remains quite popular to this day in India. Not very much is known about the method of Thomas’ execution but that maybe due to the fact that he was a missionary in faraway India. Church tradition says that while he was establishing a church there, he was stabbed with a spear, dying from the wound. The irony here is that Jesus told Thomas to touch his side and his hands where the wounds from the cross were still visible (John 10:27). There are so few historical facts that are available beyond this account that we cannot add much more to this account and do so with absolute certainty. Thomas got a bum rap. He was no more doubting than the rest of the disciples and the only reason he doubted and the others didn’t was because they had seen the resurrected Christ. When the women came back from the empty tomb and after seeing the risen Christ, the disciples also doubted. To me, there is no doubt that Thomas was a strong believer and a powerful missionary used by God to the glory of God. I often wonder if it is easier to believe in our generation than at the time of Jesus. After all, the Bible tells us that “There was nothing beautiful or majestic about His appearance, nothing to attract us to Him”(Isa 53:2). As you said, the disciples eyes were blinded to God’s plan of redemption, having looked for an earthly Kingdom, which dream was dashed by the Crucifixion. Finally, the disciples had no present day “cloud of witnesses”(like we do today) as the Jewish leaders were the ones who killed their Messiah. I think I would have been just as skeptical(or more) as Thomas. Thank you for defending one of the great apostles of the faith. Thanks brother. Yes, that is a very good observation that it would have been harder then than it is today…and that’s because we have the assembled New Testament as they still had only the Old Testament. I like your Isaiah 53:2 citation because if we saw Him in his humanity; got hungry, grew tired, etc. then yes, I think it would’ve been harder to believe then, after His death, than it is today. I think Thomas got an unfair, bum rap and label “doubting Thomas” which if any of us would have been there, as you rightly said, just insert our name there. He likely had stronger faith than anyone alive today, in my opinion. I empathize with Thomas. If Jesus had not said that every eye will see him at His second coming, I don’t think many of us would recognize Him or believe in Him. I do not want to be like Thomas, doubting, but it is easier said than done. I could be the twin not mentioned in the Gospels, “doubting Carmen.” One of my daily prayers is for the Lord’s “help” for me to believe Him and His Word since doubts are an unwelcome everyday presence through the mundane, the trials, the hurts, and the longings in my daily life. Thank you Carmen…good to hear from you again. I think we all have seasons where we doubt and I would rather have someone doubt than be overconfident to the point of no worries whatsoever at anytime. I am with you on the Thomas twin deal my sister in Christ. The minds defence is doubt and question from statements prepositions and random thoughts. I had only known that Thomas was doubting but did know all disciples were killed except John who was on the Isle of Patmos. (Correct me if I am wrong). I didn’t realize that he travel to India & made a big impact on beginning the Christian movement there.it would be interesting to know what each disciple accomplished (ie starting the ‘Jesus movement’) in specific places they travel. Of course I know they largely impacted where they travel but wondered if there is historical foot notes to what happened in areas where they preached. Does this mean that the 12 disciples were literally the original truth tellers about Jesus during his life & death? All believers stem from those twelve? This feels like a silly question & should be evident to me but I hadn’t thought about it until I read about Thomas going to India & the impact he made on that nation. Thank you friend for your comment. TO know how the other apostles died, we have an article on this at: http://www.whatchristianswanttoknow.com/how-did-the-12-apostles-die-a-bible-study/ that might answer your question sir. I read about Thomas going to India & the impact he made on that nation. Da 2:22 He revealeth the deep and secret things: he knoweth what is in the darkness, and the light dwelleth with him. The bible is written in two languages, the (prophecy-mystical-spiritual) and the physical. The physical is for all to see, however, within the prophecy is a mystery language to be revealed at a future time. When the spiritual-hidden- language is separated from the physical then the physical language reveals the hidden mystery regarding the future prediction. The mystery, that is now revealed in, The Revelation of Saint John’s, “ seven churches,” are the seven churches, “ Thomas built in Asia.” Rev 1:20 The mystery are the seven churches. “The Gospel According to Thomas,” discovered in 1945 was revealed to the world, in 1948, when Israel, as God promised, became a nation and returned to their own land. The internet is full of information regarding the life and death of Thomas. Unfortunately, and actually, there is far more information about Thomas revealed, in the last twenty years of his life, than is revealed about the life of Jesus. Thomas, recorded, arrived in India in the year 52 AD. This time, another prophecy is fulfilled and revealed regarding the seven churches in Asia. India is in Asia. He was first in the state of Kerala where he established seven churches. Thomas was killed, pierced in the side by the lance of a Brahmin, in 72 AD and is said to be buried in one of the churches. Da 12:4 But thou, O Daniel, shut up the words, and seal the book, even to the time of the end: many shall run to and fro, and knowledge shall be increased. Daniel promised at the time, near the end, knowledge would be increased. The world can find the seven churches of Saint Thomas on the internet. Therein, they are also identified as the seven churches of the Revelations. Since there were three disciples with the first name of Judas, Thomas also had the nickname of, “John.” Rev 1:9 I John, who also am your brother, and companion in tribulation, was in the isle that is called Patmos, for the word of God, and for the testimony of Jesus Christ Mt 17:1 Jesus taketh John his brother! Now, revealed, for all the world to witness, are Thomas’s seven churches which are the seven churches predicted in, “ The Revelation of Saint John” Additionally, revealed, is the resurrection of the dead or reincarnation. from him which is, and which was, and which is to come; Thomas, the last, is to come. Prophecy that revealed the seven churches and new nation of Israel. Rev 1:20 The mystery which thou sawest are the seven churches. Jer 23:8 But, The LORD liveth, which led the house of Israel from all countries whither I had driven them; and they shall dwell in their own land. Very interesting analysis of his doubtfulness. In a way his doubtfulness has made him a part of the history. He is the only guy who touched the wounds of Risen Christ and testifies that Lord was really raised after He was crucified. The cruxification and death of Jesus, told by all, had to be very hard on Thomas and for Thomas to then be labelled a doubter, when he laid down, or would have right? His life as just about asboutll know it to be. Brave, strong, firm, Thomas gets an unfortunaye rap and the assembled new testiment is know and then some, it’s astonishing and say mercy, love, but Thomas stand and just happened to doubt. What about burning? Psalms 56 states I walk in the way of the light of life, right? God’s seal upon me, in God I trust, man can do nothing to me. David is amazing. He doubted at times too huh? Psalms 56 is very personal to me. I have touched people by psalms 56 being read and the bible opens up to them but they doubt like Thomas too. All apart of being a Christian I guess. I don’t know, not truly so but to be sleeping, dead right? And then live must be amazing. Countable path, Christ like we struggle and Thomas does to. Or did I guess, one just has to believe God. In Spirit and in Truth. I looked up my name and what it means is funny. No big deal. Just looking for other worshippers, know god, know christ. Within and around me , it’s nice. I want to learn about the book. I know nothing about any of it, and much more. If I will that he tarry till I come what does that mean to you? This is nice to !! The life of Thomas after Pentecost? Hello Dorothy. Scripture is silent on what happened to Thomas after the Day of Pentecost but Thomas is surely serving as an Apostle at that time with the rest of them. Thomas wrote the book of Hebrews!!! This is NOT a theory. I asked the Lord just yesterday about this book because of how much it has helped me, and I saw the name THOMAS instantly! Take it to the Lord and ask for confirmation–I am not presuming! My friend. God does not reach out of heaven to tell people who wrote what books of the Bible. Most are self-authored. This has been established by theologians and scholars for thousands of years, so my question is, Which “god” is it you heard from and who or what spirit, good or bad, let you see the name of Thomas? No, Paul or perhaps even Apollos or Barnabas, but most agree it is the Apostle Paul and not Thomas. He never wrote a book in the Bible. Please reconsider where this “lord” is from as Satan has his own ministers too. Next post: What Were The Epistles In The Bible? What Does Epistle Mean?